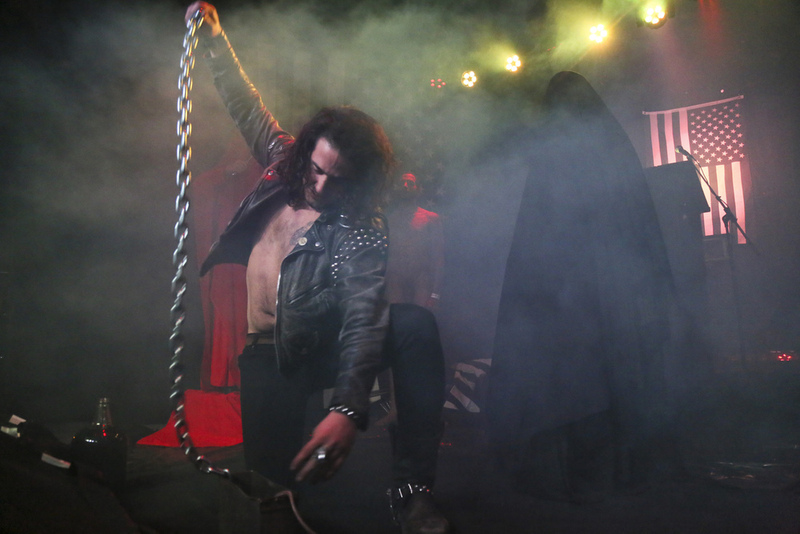 Inspired by the film The Witch, The Satanic Temple crossed the nation February 2016 to present a four-part cycle of interactive performances to reify the witch - and herald a new Satanic American era. The Sabbat Cycle mirrored phases of becoming in the personal road to Satanism, a philosophy which empowers individuals through the shameless affirmation of human spirit, relentless inquiry, and rejection of arbitrary authority. Each event in the cycle was an attempt to create a psychodramatic environment in which participants were able to negotiate truths about their internal dispositions, confront self-regulation and empower indulgence. The cycle concluded with a call for engagement and action - to place flags in spaces that require Satanic insight, a promise to hold institutions of shame, and unregulated power in check and demand an end to apathetic indifference from our supporters. Inspiring a conscious recognition of the primal self and negotiation of volitional restraints and complacency. The confrontation of oppressive social, sexual, and psychological subjection. The rejection of injustice and destruction of symbolic power. An exposition of collective strength and call-to-arms for a Satanic uprising against the tyrannical vestiges of bigoted superstitions. The proclamation of a new era of liberation and unfettered inquiry both for the individual and the coalition of the revolution.